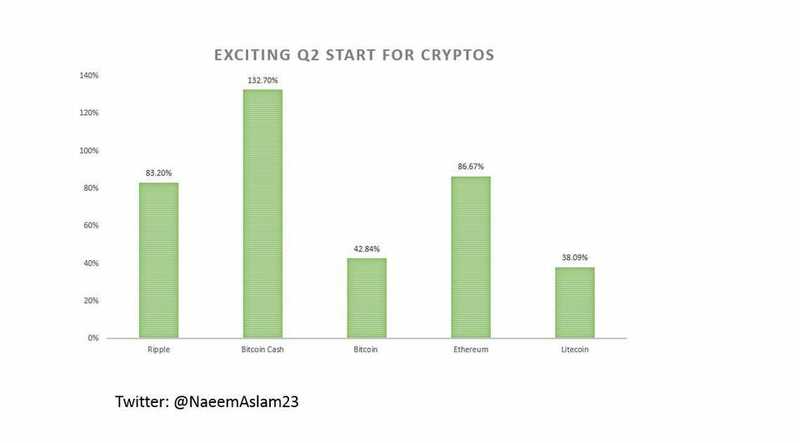 The crypto market has been catching a nice bid in Q2, with positive bullish sentiment making its way back into the market. Bitcoin has touched the high of $9755 in April and it could break the $10K very soon. It is up nearly 42.84% from its low since the start of Q2 and it may seem like a dream of a return for the average investor. But many other cryptocurrencies have outshined Bitcoin’s Q2 performance already. From the table below, rival Bitcoin Cash (B-cash) has put on impressive gains with an increase of 132% pushing the price above $1,500 for the first time since mid-February. Ethereum has put up a strong number with a positive return of over 86.67%, sitting just above $684. Let’s not forget about Ripple, it is up 83% from its low since the start of Q2. Litecoin has also been showing strength with a bullish move notching the currency with a 38% gain since the start of Q2. Big numbers indeed by any mean. However, we still need the crypto-king (Bitcoin) to break the $10K mark because that has the potential to change the game. $10,000 is a large psychological barrier for Bitcoin, and it is very possible that this barrier will be broken once again. However, from a technical standpoint, there is some resistance that will put the asset to the test. Looking at the chart, Bitcoin will likely run into resistance around $9,800 - $10,200. But a move above $10K could be very explosive and that would open the floor towards the $15K mark. Indicator investors (who base their strategies on technical analysis) should be looking at the Relative Strength Index (RSI). On the daily chart for Bitcoin, RSI is creeping up nearing overbought territory around 70. Traders should be cautious with prices approaching resistance levels while RSI is closing in on the overbought territory. A healthy pullback would be ideal to allow RSI to cool off in preparation for the next leg up. In the wake of bullish price action, Goldman Sachs has announced their hiring of a securities trading expert to help the firm launch a new digital asset investment strategy. The rumours of large institutional involvement seem to be coming to fruition, providing long-term holders of crypto assets encouragement that big players are looking to enter the market. This news will surely stir up the old discussion of whether or not Goldman Sachs will launch an OTC crypto trading desk for its clients. As of now, the addition of any cryptocurrency trading desk is not in the works for Goldman Sachs, but will that always be the case? With Goldman’s addition of Justin Schmidt to lead the digital assets division it is safe to say the firm may be taking a step in that direction, but for now, Goldman Sachs denies any such plans. However, many traders believe that we are out of the woods when it comes to the bear market but only time will tell if the bear trend is broken for sure. If Bitcoin can break through $10,000 and continue its trend reaching $12,500, a case for an emerging bull market will be much greater. Overall, the sentiment in the market is positive and fundamentals continue to improve and increase investor confidence. As of now, things appear to be making an exciting run headed further into Q2 of 2018. Disclaimer: I hold crypto-currencies in my wallet.